Shooting guard Camila Suarez (178-SG) put on an amazing game in the last round for Rocamora, receiving a Interperformances Player of the Week award for round 7. The player had a double-double of 19 points and 11 rebounds, while her team beat Velez S. (#5, 1-6) 74-64. Rocamora is placed at 3rd position in Argentinian LaLiga. Rocamora is a typical solid league team placed somewhere in the middle or a little bit lower in the standings. They need more victories to improve their 3-3 record. In the team's last game Suarez had a remarkable 71.4% from 2-point range. She just recently signed at Rocamora, being already a very valuable addition to the team. Camila Suarez has solid league stats. She is league's best scorer averaging so far 17.0ppg. Suarez is in league's top in assists (7th best: 2.8apg). 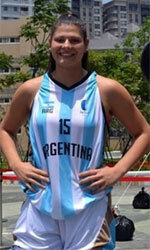 The second best player in last round's games was 17-year old Brenda Fontana (185-C-01) of Velez S.. Fontana had a very good evening with a double-double of 19 points and 17 rebounds. Bad luck as Velez S. lost that game 64-74 to slightly higher-ranked Rocamora (#3, 3-3). Velez S. are still at the very bottom. 6 lost games are too many comparing to just one victory Velez S. managed to get this year. Fontana is well-known at Velez S. and is a proven leader in her second season with the team. She belongs to the best scorers in the league with 14.7ppg (#4). She also registered 7.7 boards per game. Third on the list of top players last round was former international forward Julieta Armesto (179-F-94) of league's second-best Berazategui. Armesto scored 12 points and grabbed eight rebounds. She was a key player of Berazategui, leading her team to a 67-46 easy win against #4 ranked Obras Basket in a game of the week. Berazategui needs these victories very badly if they think about taking over top position in the standings. Their record at this point is 5 victories and 3 lost games. Armesto has a great season in Argentina. After only 8 games, she made it on the list of the league's leaders in rebounds with 6.5rpg (9th best). The most exciting game was a derby match between two local teams from Buenos Aires: Berazategui (#2) and Obras Basket (#4). Obras Basket was crushed at home by 21 points 46-67 and even the advantage of their own court did not help. Berazategui forced 20 Obras Basket turnovers. It was a great evening for the former international forward Julieta Armesto (179-94) who led her team to a victory scoring 12 points and 8 rebounds. Swingman Agustina Garcia (173-96) helped adding 16 points. Berazategui's coach felt very confident using 10 players which allowed the starters a little rest for the next games. At the losing side power forward Johanna Puchetti (191-87) responded with 15 points and 8 rebounds. Berazategui have a solid series of three victories in a row. Defending champion maintains second place with 5-3 record having just two point less than leader Quimsa. Obras Basket at the other side keeps the fourth position with four games lost. Berazategui's supporters look forward to another derby game next round, where their team will travel locally in Buenos Aires to the arena . In the last game of round 7 bottom-ranked Velez S. lost to Rocamora on the opponent's court 64-74. The game between closely ranked teams ended with 5th ranked Velez S.'s (1-6) road loss to fourth ranked Rocamora (3-3) 64-74 on Friday. It was a great evening for Camila Suarez (178-0) who led her team to a victory with a double-double by scoring 19 points, 11 rebounds and 4 assists. Point guard Antonella Gonzalez (155-90) helped adding 21 points and 5 rebounds. At the losing side center Brenda Fontana (185-1) responded with a double-double by scoring 19 points and 17 rebounds and Malena Velasco (170-99) scored 20 points. Rocamora moved-up to third place. Velez S. lost third consecutive game. They stay at the bottom position with six games lost. Rocamora are looking forward to face Obras Basket (#4) in Buenos Aires in the next round. Velez S. will play on the road against the league's leader Quimsa in Santiado del Estero and is hoping to prove to their supporters that they can break losing series. The most exciting game was a derby match between two local teams from Buenos Aires: Berazategui (#2) and Obras Basket (#4). Obras Basket was crushed at home by 21 points 46-67 and even the advantage of their own court did not help. Berazategui forced 20 Obras Basket turnovers. It was a great evening for the former international forward Julieta Armesto (179-94) who led her team to a victory scoring 12 points and 8 rebounds. Swingman Agustina Garcia (173-96) helped adding 16 points. Berazategui's coach felt very confident using 10 players which allowed the starters a little rest for the next games. At the losing side power forward Johanna Puchetti (191-87) responded with 15 points and 8 rebounds and guard Florencia Martinez (171-94) scored 10 points and 6 rebounds. Berazategui have a solid series of three victories in a row. Defending champion maintains second place with 5-3 record having just two point less than leader Quimsa. Obras Basket at the other side keeps the fourth position with four games lost. Berazategui's supporters look forward to another derby game next round, where their team will travel locally in Buenos Aires to the arena . 24-year old forward Maria Juiordhuil (177-F-94) had an amazing evening in the last round for second-ranked Berazategui and receives a Interperformances Player of the Week award for round 6. She had a double-double of 16 points and 10 rebounds, while her team crushed Rocamora (#4, 2-3) with 22-point margin 80-58. The game was between two of the league's top four teams. Berazategui maintains the 2nd position in Argentinian LaLiga. They would have been even better if they hadn't lost a few games earlier this season. Berazategui will need more victories to improve their 4-3 record. It was one of impressive evenings for Juiordhuil as usually she does not deliver so high stats. Juiordhuil has impressive league stats. She is in league's top in points (8th best: 11.6ppg) and averages solid 51.4% FGP. 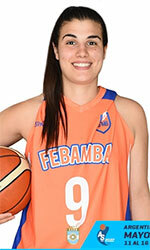 Second best performed player last round was Belen Echeverria (178-PF-89) of Obras Basket. She is a forward in her 3rd season at Obras Basket. In the last game Echeverria recorded impressive 16 points and 7 rebounds. Bad luck as Obras Basket lost that game 65-73 to slightly higher-ranked Quimsa (#1, 5-1). 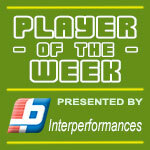 It was definitely game of the week between two contenders to the title. Obras Basket still maintains its place in the top 3 of the standings, even despite this loss. Her team's 3-3 record is not bad at all. Echeverria is one of the most experienced players at Obras Basket and has a reputation of one of team's most reliable players. Third place about best performers goes to another Berazategui's star - swingman Agustina Garcia (173-F/G-96). Garcia scored 20 points. She was another key player of Berazategui, helping her team with a 80-58 easy win against #4 ranked Rocamora. Berazategui needs these victories very badly if they think about taking over top position in the standings. Their record at this point is 4 victories and 3 lost games. Garcia has a great season in Argentina. After only 7 games, she made it on the list of the league's leaders in points with 11.3ppg (9th best).